Andrei Gelasimov’s “The Lying Year” evokes the shifting morality of Moscow in the 1990s; behind the glamour is the emotional carnage of a world where trust is impossible. When we first meet young Mikhail Vorobyov he is out-of-work and freezing. Then his old boss, Pavel Petrovich, re-hires him to look after his reclusive teenage son and “make a man of him.” Mikhail can’t believe he is being paid to drink and “chase women.” Gelasimov satirizes the international ambitions of Russia’s new rich: “My father says I’m supposed to go to Oxford in a year, but, like, I’m a total moron.” Pavel is also trying to marry his son Sergei to the unprepossessing daughter of his Italian business partner, Signor Panucci. Sergei has a secret girlfriend, Marina, and chafes against his chauffeured, rich-boy existence. After ninety pages, he takes up the narrative. Sergei’s diary entries describe the pain beneath his pampered life. He charts death, abandonment, infidelity and isolation, in a heartbreakingly simple style, laced with the violent, suicidal impulses of youthful disaffection. It is characteristic of Gelasimov’s work that profound and poignant moments are embedded in a brutal and realistic narrative. There is no room for sentiment. Translator, Marian Shwartz, has perfectly captured Gelasimov’s voices, just as she did with “Thirst,” which came out in late 2011. 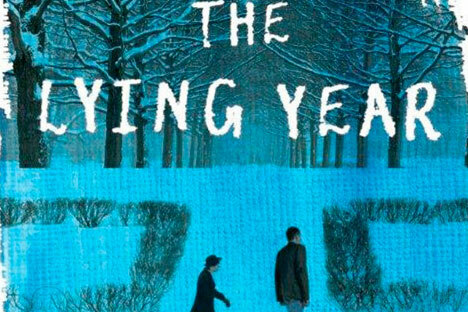 “The Lying Year” is a dark comedy in Gelasimov’s usual, colloquial vein and explores fragmented, postmodern life, with its endemic failure to connect. The entertaining dialogues are exercises in mutual misunderstanding or faux-camaraderie. Early on, Mikhail and Pavel knock back shots of “Genuine Scotch” and compile synonyms for “smashed”: “wasted” and “hammered.” It is reminiscent of the famous Eskimo words for snow, but typically Gelasimov doesn’t labor the point. Moscow’s dangerous and confusing post-Soviet years are rich material for satire and tragedy. Gelasimov catches the superficial veneer of wealth that turns life into a surreal film. The “men in black” arrive to collect Mikhail in their impeccable white shirts and “black BMW with tinted windows.” Behind the glamour is the emotional carnage of a world where trust is impossible. “I got money crazy,” Pavel writes to his estranged wife. He mocks her new life with a Swiss artist and quotes Pascal, (“your bearded, poorly dressed friends’ favorite philosopher”): love and belief are natural and so, “for want of true objects, they will attach themselves to something false.” Deception and self-deception reverberate throughout the novel. Sergei’s mother asks him to hide their correspondence from his father. “Tell him some lie. By the way, have you learned to lie?” The letter is a brilliantly economical portrait of destructive family dynamics. There are clear parallels with “The Cherry Orchard” as well as a kinship between Gelasimov’s work and Chekhov’s. Both writers aim for maximum insight through deliberately minimalist style. In the background of “The Lying Year,” prices rise every day, politicians are shot, money is all-important and yet “vanishes like the wind.” Gelasimov subtly evokes the moral confusion of human beings trying to adjust to a world in flux. “The Lying Year” was published by AmazonCrossing on January 8, 2013. More translations of Gelasimov’s novels are due soon.